Checkered, floral, sequins oh my. Fall is here!! If you haven't realized by my latest posts, I love me some fall fashion. I'm such a black and white palate type of girl. I force myself to incorporate some sort of color, print, and sparkle into my wardrobe. Hello pencil skirt. Perfect silhouette and perfect piece to get just that. 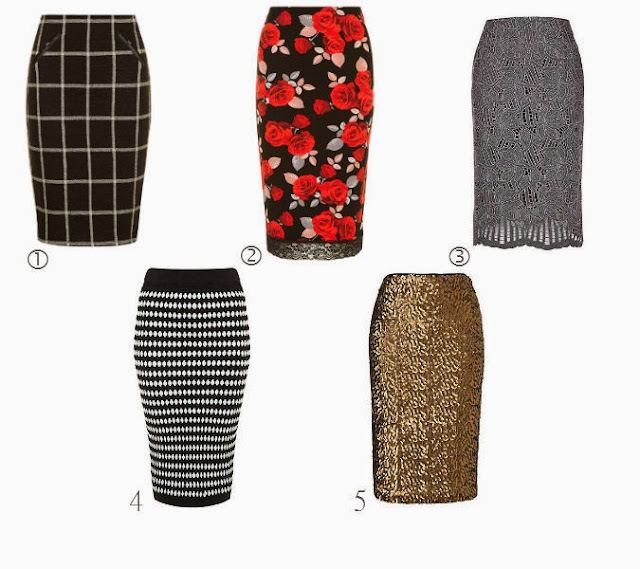 Nothing says tailored, well put together, and chic than a beautiful pencil skirt. Also such a well fitted item, in my humble opinion, oozes the look of "I'm not ashamed of what my mamma gave me." A midi pencil skirt, hitting right below the knee, hugs the curves (well mine for sure) in just the right amount to take you from the office to drinks out with the girls. Please get your life with these 5 pencil skirt options.